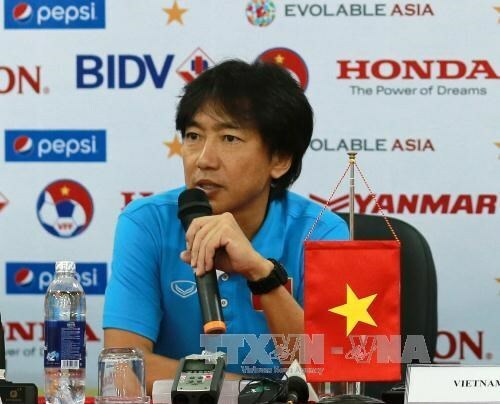 Hanoi (VNA) - Coach Toshiya Miura has announced the player list of the Vietnam U23 team to compete in the 2016 AFC U-23 Championship's final round in Qatar. There are seven players from Hoang Anh Gia Lai (HAGL) out of 23 players such as goalie Pham Van Tien, midfielder Nguyen Tuan Anh and strikers Nguyen Cong Phuong and Nguyen Van Toan. Miura also called four other players from Hanoi T&T including goalkeeper Phi Minh Long and striker Pham Van Thanh. A total of 16 teams qualified to play in the tournament, including Qatar who qualified automatically as hosts. According to the event's draw, Vietnam are in Group D with Jordan, Australia and the UAE. They will meet Jordan tomorrow, Australia on January 17 and the UAE three days later. All matches will be broadcast live on VTV6 channel. The top three teams of the championship will qualify for the 2016 Summer Olympics men's football tournament in Brazil./.